The skies just cleared from a recent downpour, and your loyal companion - Sparky - is running through your muddy mess of a yard toward the patio. His lovable face is ecstatic, his tongue is flopping in the wind...but his paws are covered with mud. He leaps and bounds toward your beautiful concrete acid stained patio. You try to stop him, but it’s too late. That Island Sand Artist Grade Concrete Stain now features big, muddy footprints. No big deal, right? All you need to do is bring the hose out, and those footprints will disappear. 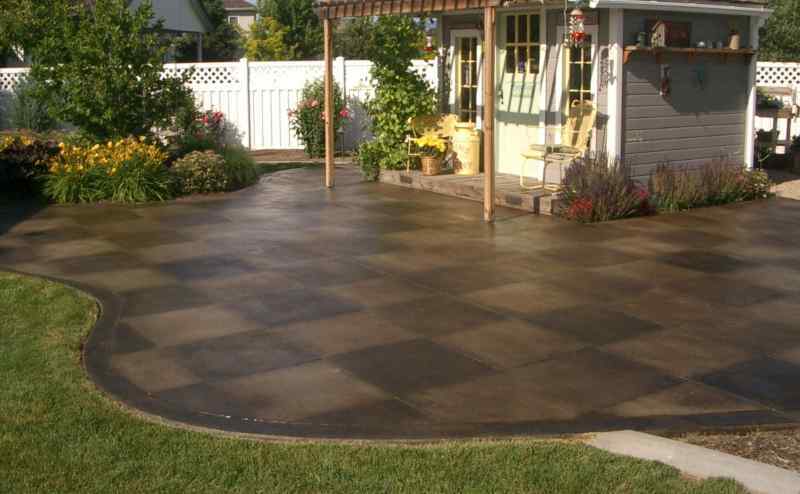 Well, that’s only if quality concrete sealer covers your patio. Mud is challenging to clean because it seeps deep down into the pores of exposed concrete. That's when you'll be hoping your concrete sealer stands up to the task. You did your research and meticulously put in the time and effort to properly clean and prepare your concrete to apply concrete stain. Scenarios such as Sparky’s sloppy feet are why we strongly recommend sealing your finished product. 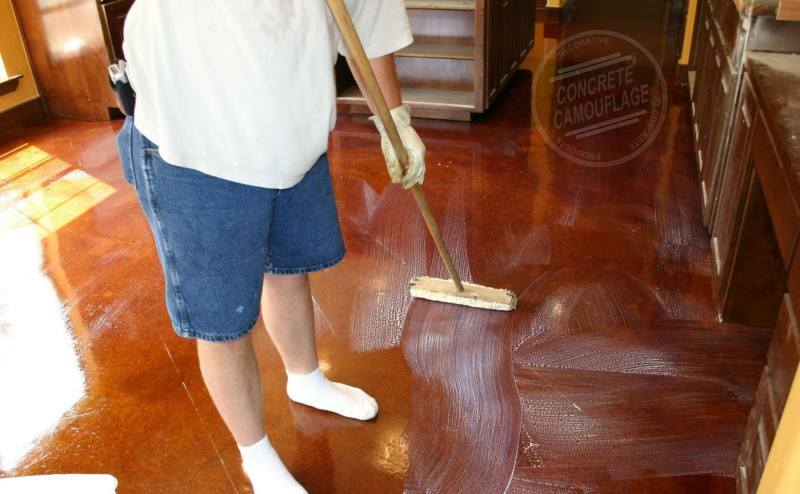 But should you use a solvent based sealer or a water based concrete sealer? Solvent based sealers tend to have a high gloss and make concrete look like it does when it is saturated wet with water. This over darkening of the concrete can hide many of the nuances in stain as well as the color variances that’s desired when acid staining concrete. Clear Shield water based sealers make the concrete look like it does when it is damp with water - not saturated wet or dry, rather in between, damp. This enhances the colors while still allowing the variances and nuances to proudly show through. The water based sealers have a satin or semi gloss finish. However, if you apply one or two extra coats, you can usually achieve a higher gloss as the sealer builds up to a thicker finish. Make sure to give each coat time to dry before applying another one. Applying Top Shield floor wax in either the high gloss or matte finish allows you to alter the final finish of either sealer to your desired glossiness or lack thereof. So if you intend to wax your concrete floors or even patios, porches and walkways, the gloss level of the sealer is irrelevant. Because you apply solvent based sealers at such a thick consistency, they can become slippery, especially when wet. A grip traction additive can be added, but it is still more slippery than water based sealers. The other way to help reduce the slippage is to apply a Top Shield floor wax. Comparatively, you want to apply water based sealers in layers that are as thin as possible. That allows the texture of the concrete surface to still come through a bit, meaning better traction. However, any sealed concrete can be slippery when wet, and while water based sealer is less slippery than solvent based, you can also use the Clear grip or Top Shield with it to ensure extra traction where needed. Solvents go on thick and water based sealers go on thin as previously mentioned. This means that you’ll get more coverage from a gallon of water based sealer. Most solvent based sealers cover approximately 800 sq.ft. +/- per 5 gallon pail. Clear Shield Premium water based sealer covers about 2000 sq.ft. at the recommended 2 coats. Solvent based sealers were traditionally more durable and capable of withstanding more damage. However, with the newer technologies and breakthroughs, many water based sealers can hold their own quite well. 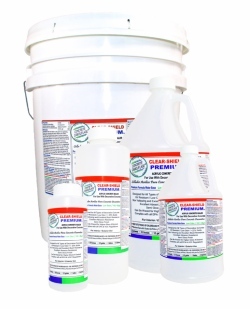 Today there are very few - if any - solvents that can outperform Clear Shield. That’s mostly because of the advancement in water based sealers and partially because of the regulations placed on solvent manufacturers in the past 10 years, diminishing the quality. As a note, several states have either already outlawed or are in the process of outlawing most solvent based sealers because of the volatile organic compounds (VOCs). We previously made Clear Shield solvent based sealer, but the Environmental Protection Agency and several State agencies lowered the VOCs throughout most of the country due to safety and the environment. We found that it was quite challenging to create a quality product with the lowered VOCs regulation, so we turned our focus toward the water based sealers instead. We’re very glad we did because the benefits to our customers are numerous. When applying the sealer indoors, regardless of which you choose, you’ll need to apply and maintain a quality floor wax. The wax acts as the sacrificial coat that protects the sealer. However, when outdoors, it is important to note that while Clear Shield water based sealers and many others allow the concrete to breathe, solvent based sealers do not. What this means is that during rain or periods of heavy moisture, the water that is in the ground can wick through the concrete on a path towards the surface. When the moisture meets a solvent based sealer, it is stopped there. With time, this process will eventually work to break the sealer’s bond to the concrete, and it will then begin to look horrible and finally start to flake off. Water based sealers that are designed to breathe - such as Clear Shield - allow a certain amount of moisture to escape through the sealer and evaporate, thereby helping to prevent the bonding issue. There’s a chance that could also happen with a water based sealer, but the odds are on your side. Our water based sealer is a safer choice for a few reasons. The first being that it’s simply not as slippery as solvent based sealers, making it a bit more family-friendly. It’s also a green product. Currently, the new Clear Shield Premium formula water based decorative concrete sealer is by far the most popular sealer, from do-it-yourself enthusiasts to contractors. Water based sealers are also safer to apply. Solvent based sealers are flammable and require you to turn off all gas and pilot lights. Water Based sealers are not a flammable product. Solvents are also very aromatic, meaning they’ll get you high as a goofy kite when applying in an enclosed area and leave you with a huge headache when you come down. If using indoors, you’ll need to stay out while the fumes air, which likely means a night at the motel or the mother-in-law’s house. Water Based sealers don’t come with either of those headaches. Wondering how to apply water based concrete stain sealer? It’s not challenging - promise! First, ensure your concrete is dry, and any residue from the acid stain has been thoroughly neutralized and rinsed and is free from dirt. Then put the sealer in a paint pan - don’t pour it directly onto the concrete! Use a paint roller to apply the sealer in two very thin, even coats similarly to how you apply paint - back and forth, in varying directions, overlapping and smoothing out. Make sure you don’t simply apply it in straight lines, like in the photo below. 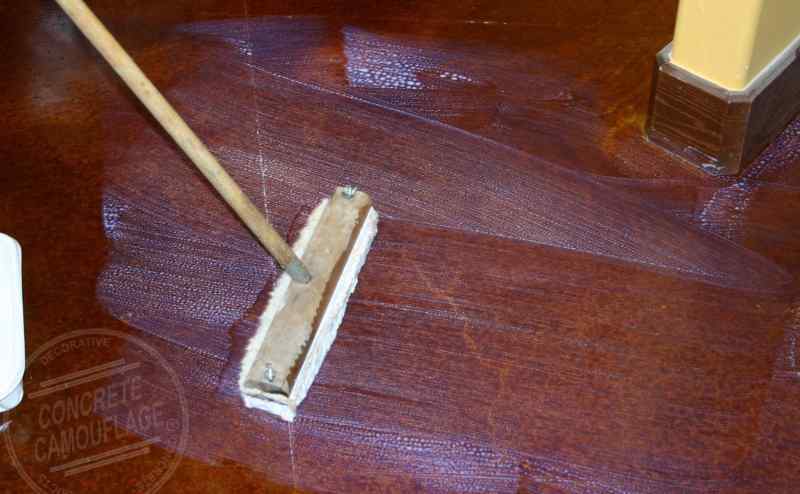 Allow each coat to dry completely clear, including in any cracks or corners, before applying additional coats. This usually takes about an hour or two - in warm weather and low humidity. Speaking of humidity, don’t apply unless the humidity is 65% or less and don’t allow moisture on it for at least 12 hours. Once you have your final coat on, give the water based sealer at least 24 to 48 hours to cure before applying wax or any form of traffic - especially Sparky’s muddy, messy feet! The sealer cures completely within seven to 10 days in warm weather and 10 to 14 days with cooler weather, so don’t drive your car on it for that amount of time. With water based sealer, Sparky can walk his muddy paws all over your concrete acid stained surfaces without damage, and your idea of hosing it off will actually work!